Please be aware that this “Members Only” site is in its infancy. Hopefully it will become a continual work in progress. We are experimenting with using YouTube videos, videos from manufacturers, and PDF files to provide journeyman retraining for anyone that is interested. We have started with only two topics: “Conduit Bending” and the “National Electrical Code.” Therefore, we are asking for your assistance in determining the future of this site. After reviewing the preliminary “Members Only” site, please fill out the Site Survey to help select what future topics will be added to our site. You may fill out the survey additional times if you have any additional ideas. Please remember that this site is for members of IBEW Local 64, IBEW Local 573, Mahoning Valley NECA members, signatory contractors and their employees. If anyone has information that you feel would be beneficial to this educational site, please forward it to your business agent, chapter manager or email to info@ibewneca.com. 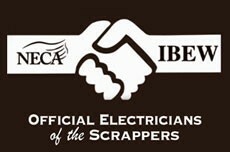 If you have reviewed any videos in the past that would be helpful, please email that site address to info@ibewneca.com. Our goal is to create a sub-committee of the LMCC committee that will work to improve the educational site of the LMMC page. If you have any interest in helping with this, please forward your name, email and phone number to info@ibewneca.com. Thank you in advance for your assistance! !